What to do with Leftover Yarn? Knit Sheep! What do you do with all those single balls of left over yarn? When I googled this for inspiration I did get a lot of silly suggestions such as a sweater fit for a mouse or an itty-bitty acorn or a bunny smaller than your fingernail! I wanted to make something more useful. Having recently moved house and decorated a few rooms I realised I needed something to guard my walls against damage from door handles. 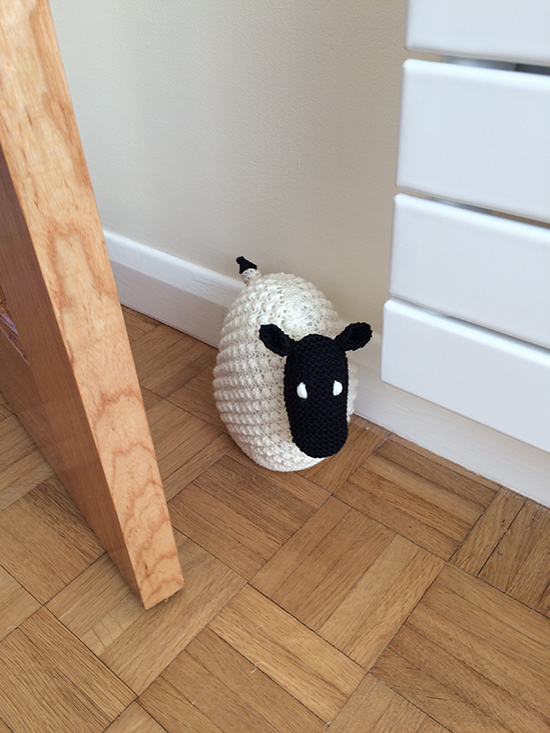 So I thought I would look for a door stop pattern and found this one for a sheep designed by Denny Gould. Sheep was ideal as my back garden joins a field full of sheep which are about to give birth to cute little lambs. I bought the pattern from Denny’s website www.iKnitDesigns.com. 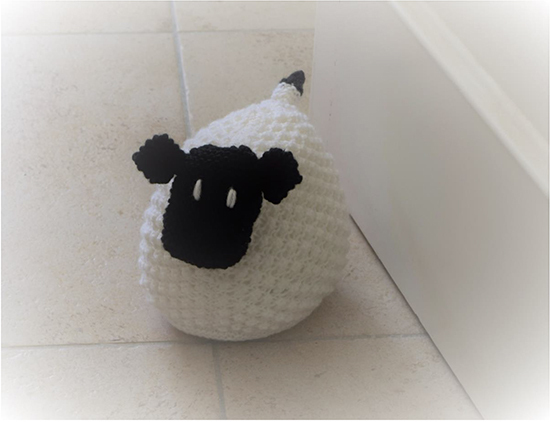 She has many sheep themed items such as children’s cardigans, sweaters, blankets and cushions. The pattern required DK yarn which was perfect as I had two balls of Rowan Pure Wool Superwash DK one in white and one in black. It was very easy to knit and sew together; I enjoyed knitting up something small and quick. To give it some weight I filled it with some rice sealed in a plastic bag and then surrounded this with some toy filling to make it soft against the walls and the door. And here it is….. So, tell me, what do you do with leftover yarn? Do let me know by clicking on the “Reply” link below….. I need more ideas! This entry was posted in Knitting with Rowan Yarns and tagged Denny Gould, DK Knitting Yarn, Rowan Pure Wool Superwash DK by Esther. Bookmark the permalink. Make a small child’s toy from Susan Anderson’s book or donate the yarn to my local middle school which has a knitting club! Knit squares or take to church for other knitters to knit! The squares are then sewn into blankets and sent out to the needy.